Ethnic Drum Loops - Ethnic World Percussion Rhythmz + Hip-Hop Drum Loops all in one! DOWNLOAD Over 200 Ethnic Urban Drum Loops w/ Free Upload! Download Ethnic Drum Loops 1 - Engineered & mixed to perfection, this powerful urban ethnic loop library comes packed with 200 sizzling ethnic drum loops (525+ files) at tempos 87BPM & 97BPM provided in Acidized WAV, Apple loops AIFF, & Reason REX2 formats. Ethnic Drums Loops 1 features the hottest ethnic drum loop rhythms to grace hip hop production! A plethora of world & ethnic instruments were used to produce the loopset including the agogo bell, berimbau, cabasa, cajon, chaker, chime, congas, cowbell, clave, djembe, doumbek, gankogui, guiro, nubell tree, pandeiro, rainstick, sleigh bell, talking drum, timbale, tombek, triangle, & udu - Not to mention tons of modern urban drums! Ethnic Drum Loops Collection - Download the complete collection (Volumes 1 & 2) for over 400 original modern ethnic drum loops (1025+ files total) across 4 tempo groups (87BPM, 92BPM, 97BPM, and 102BPM) provided in 3 formats (WAV/AIFF/REX2). Thw whole two-volume series mix-matches seamlessly with all other ModernBeats Loopsets. Ethnic drum styles range widely from a myriad of classic ethnic patterns all the way to unheard of urban, jaw-dropping rhythms that can't be denied! Bonus: 2 FREE Song Submit uploads will be included with your order. Additionally, with the 4 variations for each of the 50 loop styles included (source beats, breaks, mutes, drops, fills, & more! ), you can effortlessly create professional productions with longer phrases without having monotonous drum rhythms! 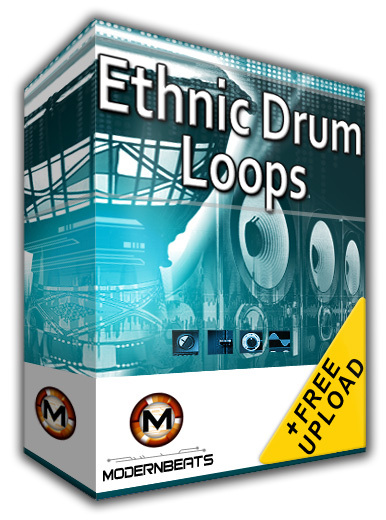 With "Ethnic Drum Loops" you aren't confined to only one or two patterns per style like most loop libraries. Now, equipped with the ModernBeats standard, you can build ethnic beats fast with access to 4 variations per rhythmic pattern! Download the complete 2-volume library to launch your music to the next level. Raise the standard, demand the best: "Ethnic Drum Loops Delivers!"